Buzz Aldrin stands near the lunar module's landing gear. Forty-nine years ago today, on July 20, 1969, humans set foot on the moon for the first time in history. Across the country and around the globe, humans sat at their televisions and watched the live coverage, waiting to see what would happen to Neil Armstrong and Buzz Aldrin. You may know what will happen, but you can channel some of that excitement today and tomorrow (July 21) by watching historic footage from the Apollo 11 mission, which NASA is streaming to mark the 49th anniversary. Watch it here on Space.com, courtesy of NASA TV. Armstrong's famous first step will come later tonight, during a moonwalk that NASA will air beginning at 10:38 p.m. and culminating in Armstrong and Aldrin planting the U.S. flag deep in the moon's rocky surface at 11:41 p.m. The footage will continue early Saturday morning as the astronauts return to the lunar module at 1:11 a.m. Armstrong and Aldrin head back to the orbiter beginning at 1:54 p.m. NASA has provided a timeline of some of the key moments of the mission if you want to clear your schedule for a particular event. 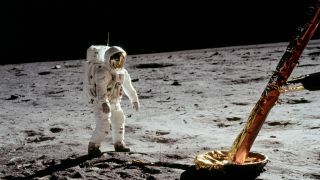 In 1969, the moon landing marked the culmination of almost a decade of top-priority research and engineering work by NASA undertaken amid serious geopolitical pressure from the Soviet Union. Americans from all corners of the country were deeply invested in the adventures of Armstrong, Aldrin and command module astronaut Michael Collins. Apollo 11's success led to five more lunar missions, with a total of 12 American men setting foot on the moon, but the moon's surface has been quiet since 1972. That may change again soon if President Donald Trump's space policy directive prioritizing lunar exploration is successful. But until then, NASA's time machine can bring you the excitement and anxiety that characterized the historic moment 49 years ago.